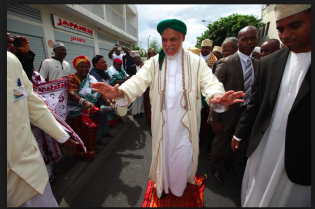 President Azali Assoumani of the Comoros Islands is tightening his grip on power. First, he insisted on holding a referendum allowing him to extend his term of office and abolish the country’s constitutional court. Which he won. And now, the lawyer of former President Ahmed Abdallah Sambi has said that his client has been charged Tuesday with corruption and the misappropriation of public funds in a passport fraud. Governments around the world shut down the internet more than 50 times in 2016 - suppressing elections, slowing economies and limiting free speech. Whistle-blowers like Edward Snowden and Julian Assange are hounded – not by autocratic but by democratic governments – for revealing the truth about grave human rights violations. Nobel peace prize winner, writer and political activist Liu Xiaobo is currently languishing in a Chinese prison while the killing of Egyptian protestor, poet and mother Shaimaa al-Sabbagh, apparently by a masked policeman, in January this year continues to haunt us. The University of Edinburgh has taken the decision to not divest from fossil fuels, bowing to the short-term economic interests of departments funded by the fossil fuel industry, with little to no acknowledgement of the long-term repercussions of these investments. While many countries appear to have met the U.N. Millennium Development Goal (MDG) of halving the proportion of people without sustainable access to safe drinking water, rights activists say that African countries which have taken to installing prepaid water meters have rendered a blow to many poor people, making it hard for them to access water. Pierre Claver Mbonimpa is not permitted to get close to an airport, train station or port without authorisation from a judge. He cannot travel outside of the capital of his native Burundi, Bujumbura. Whenever called upon, he must present himself before judicial authorities. This month’s World Economic Outlook released by the International Monetary Fund (IMF) only confirms that consequences of the collapse of the financial system, which started six years ago, are serious. And they are accentuated by the aging of the population, not only in Europe but also in Asia, the slowing of productivity and weak private investment. Lobbying is an integral part of democracy, but multiple scandals throughout Europe demonstrate that a select number of voices with more money and insider contacts can come to dominate political decision-making – usually for their own benefit. For those of us interested in a vibrant civil society, it seems to be best of times and the worst of times.